This uniform is dated 1988. 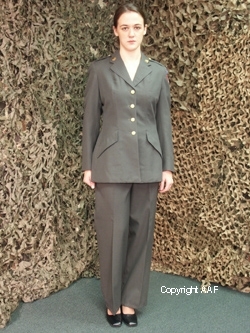 It is a US Army, "Coat, Woman's, Poly/Wool Serge, AG-344." 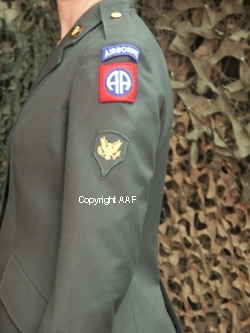 This uniform belonged to a Woman, Specialist 4, or "E-4," as is evidenced by the cloth rank patch. Prior to 1978 these women were called "WAC's," for the Women's Army Corps. This uniform is not named. It belonged to a woman who served in the Medical Corps. branch of the service as is evidenced by the round shape brass metal collar insignia. This woman also served in the famous 82 Airborne Division as seen by the cloth patches found sewn at the top of the left shoulder. The size of this uniform is a 14 short. It's condition is MINT! The uniform also includes a MINT condition pair of 1986 dated, "Slacks, Women's, Poly/Wool Serge, Green 344 Classic Design." These slacks are in a size 9S. The Tank Museum has one of the largest collections of female uniforms known at well over 300 uniforms and 600 headgear pieces. Over the years it has been observed that female uniforms are now getting the notice of traditional uniform collectors. Prices for WWI female uniforms are now in the thousands of dollars. WWII period uniforms are now in the many of hundreds of dollars with some even in the thousands of dollars as well. But lo and behold uniform collectors just have not begun to appreciate the value (and in many cases) rarity, of many post war types. Rare uniforms such as this AIRBORNE example are sure to appreciate rapidly once collectors realize just how neat they are. Here is your chance to own an affordable female AND Airborne uniform obtained direct from Fort Bragg. 1973 Dated, US Navy, "Uniform, Wmen's, Service, White", Belonging To A WAVE, Woman 1963 dated, US Navy, WAVE, Woman's Service Dress Uniform, belonging to Lieutenant Commander "E. Lindgren" August, 1956 Dated, US, Seaboard Western Airlines, Female Flight Attendant's Uniform Belonging To A Stewardess Named: "M. Lambert" Post 1951 Period, US Army, Dress, WAC, Hospital, Belonging To A WAC, Nurse Corporal Named: "Francis I. Adams"